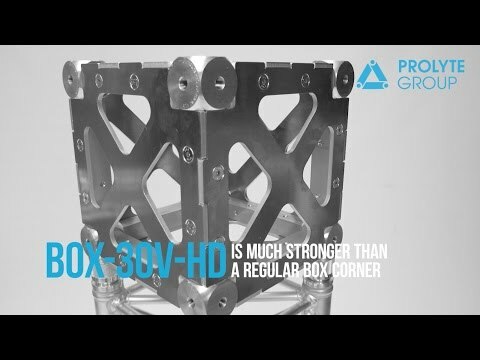 The new box corner, the BOX-30V-HD, is a fully plated and bolted element and therefore is much stronger than the regular box corner. This allows you to build any 2D or 3D structures without losing involuntary strength due to the corner types used. Due to its clever design, where the plated sides interlock with each other, the exact 90-degree shape is guaranteed. In combination with the narrow tolerances, this box corner is suitable to use in combination with the Verto truss as well. Furthermore, the plates can easily be changed in case of damages, offering an efficient and cost effective solution.